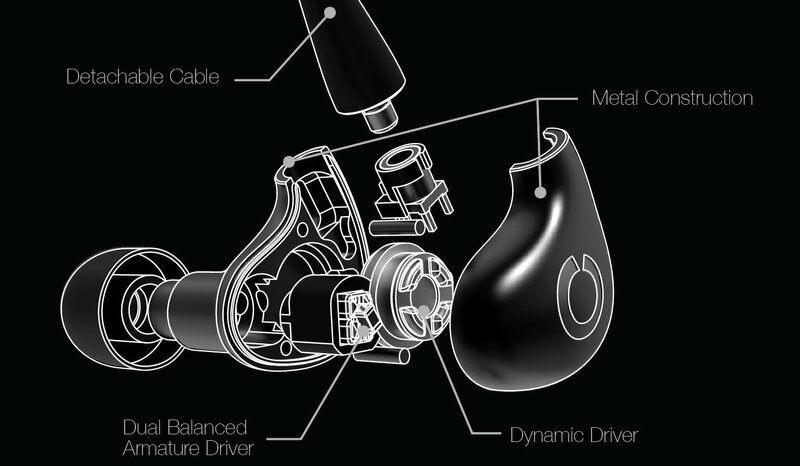 The conventional earphone uses a single dynamic driver, essentially a minute speaker that injects a high energy dose of audio energy directly into the pleasure centre. Conversely, the more boutique earphones out there assume a completely different technology, the ultra-high precision armatures used in devices such as hearing aids where accuracy of spoken voice is key. Unfortunately, these two technologies were rarely combined with palatable results. For instance, cheap hybrids were either fake or had significant crossover issues whilst, on the opposite end of the spectrum, AKG’s K3003 once considered the pinnacle of portable audio, carried an equally unmatched RRP of $1499 USD. But the same cannot be said in 2016 with beginner audiophiles being blessed with dozens of brilliant hybrid earphones ranging from Xiaomi’s $20 hybrid pistons to custom monitors that out-value some vehicles. Chinese hybrid earphones have gained quite a reputation lately, Dunu, Xiaomi and Astrotec are just a few of many names that come to mind. These are earphones unlike others, with extraordinary attention to high frequency intricacies offered by lightning fast armatures, augmented by a textured, extended bass reproduction that only dynamic drivers can achieve. But the new upstart company Oriveti, situated in the UK sets out with ambitious intentions, utilizing the tried and tested dual TWFK armature setup enhanced by a custom dynamic driver. Oriveti hopes to best these models and establish themselves in the competitive world of hybrid earphones with their $300 USD Primacy, let’s see how their first earphone performs. Oriveti makes a great impression with their professional packaging and comprehensive suite of accessories. With embossed renders on the front and an exploded vector of the earphones on the rear accompanied by specs, the packaging exhumes quality whilst remaining easy to digest. Sliding off the top cover reveals the earphones snugly nestled within a velvet textured foam that also acts as a cable winder. Whilst insignificant in the long run, the cable didn’t have the curl associated with new earphones that are usually tightly wound in box. Underneath the display foam lies the accessories in a very satisfying presentation. Each accessory is nestled within a custom cut inlet of foam with a small notch for easy removal. In this layout it’s easy to see that the Primacy comes packaged with a very comprehensive set of accessories. Orivetti include 2 pairs of each of the 3 sizes of silicone tip along with 4 one size fits all foam tips. The silicone tips are of good quality without moulding issues and a soft feel in the ear. They are transparent and perhaps prone to discolouration over time but they also have a longer than average stem that well compliments the Primacy’s medium depth fit. Using spinfits achieves a similar depth of fit and the flexible sound tube of the spinfits will fit snugly on the Oriveti’s larger sound tube. In addition, the Primacy comes with a nozzle cleaning tool, rubber ear guides and, for frequent travellers, a 1/4inch adapter and dual mono to stereo adapter. The Primacy’s come with a very nice aluminium carry case that showcases the level of finish offered by the full aluminium Primacy’s with extremely tight tolerances and a smooth sliding action. Oriveti even mill a small air channel in the top lid to prevent suction. The insides of the case have a soft velvet texture to prevent scratching the earphones though this finish did tend to leave some fur on the silicone tips. Whilst such an accessory set more or less just matches the similarly expansive set of accessories we can expect from upcoming manufacturers, Dunu is another company that likes to smother the buyer with extras, I’m not complaining about spares. Oriveti provide almost everything users could ever need, it would be nice to see some authentic Comply tips in there, preferably even a pair of Spinfits as they both work brilliantly with the Primacy. But until next time, Oriveti still do an outstanding job. Design is definitely where most hybrids falter, most simply struggle to fit such an elaborate driver array in a conventional housing, instead mustering up monstrous designs that surely appeal only to the more masochistic buyers out there. But what if you didn’t have to compromise fitment for sound quality, what if you could attain comfort, isolation and stability? If I had to choose a housing to satisfy these criteria, it would probably be that of the Phonak PFE series, PFE standing for perfect fit earphone, some of my absolute favourite earphones of all time. It takes a glance to acknowledge the similarities in form factor and the Primacy takes this classic design one step further with several key improvements. One advancement is the longer stem, allowing for a deeper fit and thus far more noise isolation. Where my former PFE232’s were a very shallow fitting earphone, the even sleeker Primacy offers a deep insertion depth only outmatched by Shure and Westone style monitors. Through it is technically vented due to the presence of a dynamic driver (vents located within the MMCX connector), isolation is very good, roughly on par to the Klipsch X10 if not better. Isolation is still slightly lower than monitors such as the Westone Um Pro line-up due to the slightly shallower fit but the metal housings isolate different frequencies better, namely low frequencies seem to be better attenuated whilst higher frequency isolation is slightly worse. Overall a great earphone for travel and given the stable over-ear fitment, activity too. The feel of the housings is also incredibly solid and reassuring, each machined aluminium shell smoothly sculpted and impeccably finished in a soft black. They’re also very compact, I don’t think I’ve seen a more ergonomic hybrid and they’re also very reasonably sized for an average earphone as seen below. The Primacy’s visual design also impress with a thin profile that lies flush in the ear, permitting side-lying whilst maintaining essentially no contact with the outer ear during normal use. The earphones slender housings also don’t protrude form the rear like most monitors and as a result, I didn’t find the earphones to form hotspots at the rear of my ear like some of these monitors. In fact, with the exception of the cable that routes over the ear, you can definitely forget you’re wearing the Primacy’s; when paired with a set of Spinfit CP100’s (used for sound analysis and photos), they’re on par with the insanely comfy PFE and Klipsch X10’s. Though the housings consist of two halves, the join is very precise with palpable but otherwise insignificant seam. They are completely aluminium but the Primacy’s aren’t much heavier than traditional monitors and stayed put during my usual 6Km run, requiring at most only a single adjustment, impressive. This stability is imparted by the longer nozzle within which Oriveti have placed the two armature drivers. There’s also a lip on the end that holds eartips on reliably. The straight, thick nozzles might look imposing but in the ear are actually very comfortable, comfort that is further enhanced when Spinfits are installed. Part of this stability also comes from the super lightweight cable. It’s a 4 core braided SPC variant with a sheath that is more rubbery than I would like but a very compliant nature that resists memory and tangles better than most. The cable also has minimal microphonics due to the combination of braiding and an over ear fit. The design is almost identical to that on the UE900 with a similar tight braid and flexible nature. I do appreciate the absence of any intrusive memory wire and the rotating MMCX connector does well to prevent the cable from flicking over the ear (silicone ear guides are included should you experience such issues). The jack is straight but luckily very compact to avoid too much strain in the pocket (also case friendly) whilst the Y-split is a simple heat-shrink affair. Whilst it doesn’t present quite as well as a moulded one, these splits tend to be more durable than molded y-splits as the cable doesn’t need to be terminated. This leads up to a straight and very tightly fitting gold-plated mmcx connector that I found to be absolutely reliable during my testing, free of any stuttering or static; I think manufacturers have mostly sorted this connector out by this point in time. There’s also a basic chin slider that gets the job done in a pinch. I do have one main caveat with the cable. I noticed that when running with my synthetic top, the cable seemed to pick up static, resulting in a kind of clicking, in that sense the cable probably isn’t adequately shielded. That being said, I didn’t notice this issue in any other instance but I also didn’t notice the static with any other premium earphone I’ve tested. I think Oriveti really nailed the design and fitment on the Primacy. They look as premium as any high end earphone and beat out almost every competitor in long term comfort whilst retaining high levels of passive noise isolation. They also have quite a lot of stability in the ear, they’re actually not a bad choice for discerning runners but I wouldn’t push them too hard given the top mounted vent that may be prone to liquid ingress. Given that most hybrid earphones have housings that defy human ergonomics, the fact the the Primacy’s outdo most conventional earphones only heightens Oriveti’s achievement. Modern hybrids have never disappointed in the audio department with a vivid, contrasty sound derived from the combination of tried and tested drivers. Oriveti is no different, more or less following this structure by combing the impeccable dual TWFK setup with an in-house dynamic driver. I love the TWFK setup to bits and have been impressed by a number of earphones using such drivers, the Audio Technica CK10, Fischer DBA-02 Mkii and Rockit R-50 of note. All had their own sound per say but remained a TWFK earphone at their base level; if you’re unfamiliar, they all sound leaner and brighter than neutral but also extremely detailed and crisp. But the Oriveti strays the furthest out of all I’ve tested and the vast majority of the time in a good way, it’s high end is smoother and the midrange tonality is closer to neutral. The low end, of course, has the biggest deviation from the TWFK sound with a very extended bass response that actually has a decent sub-bass emphasis. This leads up to the nicely textured mid and upper bass responses that are slightly elevated from neutral but otherwise very thoughtfully tuned. From basic comparison to other TWFK earphones, the dynamic driver seems to be tuned to exclusively reproduce only very low frequencies, leaving the midrange clear and the low end tight and without bloat. Compared to some higher end earphones, the primacy’s low end response remains pretty competitive. Bass extension as aforementioned is very good, in-between the bottomless ie800 and the 5 driver UM 50 Pro, which is to say, impeccable for a $300 earphone. They are missing some bass texture in comparison to both the UM 50 Pro and ie800, though they are also around half the price. Sub-bass is boosted a few dB more than the ie800 which is slightly too much for me when listening to songs which are already mastered with a lot of low end. Luckily, sub-bass notes remain relatively tight through quick decay times and the earphones rarely sound boomy or uncontrolled. Mid and upper bass responses are fairly neutral, mid-bass slightly elevated and upper bass perhaps slightly reduced from neutral resulting in a colder but not sterile midrange. As a result there is also no bass spill and I didn’t notice any coherency issues between the dynamic driver and armatures, keeping the sound nice and consistent throughout. The bass performance is very good but not quite as flawless as higher priced models, within their price range, the Primacy’s are a strong performer, suiting those who like a little more sub-bass slam whilst maintaining a super clean mid-bass response. The midrange maintains the TWFK sound, in this case, the slightly forward tuning achieving a nice balance with the similarly elevated low end. The body is slightly thinner than neutral though the lower midrange is still more natural than pure TWFK earphones. The upper mids are sublime, aggressively detailed and super clean. Vocals are sweet and nicely layered with a sharper tone than dynamic earphones without sounding grating or sibilant. As expected, the midrange of the Primacy is clearer than the UM 50 Pro, especially lower mids and upper mids are not as dark resulting in a more balanced midrange on a whole. The Primacy also has more clarity than the UM 50 Pro but slightly less detail overall. The ie800 is a more fair comparison with it’s more linear tuning, both are bright but the ie800 sounds more natural with more lower midrange body. Upper mids keep up well with both of these earphones and outpaces most I have heard in their own price range. They are slightly more detailed and details are more forward than the Westone W30 and W40 but the Primacy is also brighter. They lack just a bit of micro detail in comparison to the UM 50 Pro and ie800 however they are not that far behind. The upper midrange presentation is actually very similar to the ie800, I’m sure listeners that like a lot of clarity whilst retaining smoothness and a decent price tag will really enjoy the Primacy. The treble response takes a bit of a dip, just about neutral overall but slightly below in certain regions. For my tastes, there’s just enough to maintain an interesting listen but treble details don’t pop like the upper mids. Now by no means is the Primacy’s treble sedate or recessed, it’s just not as crisp as one would expect from a TWFK setup. I do think this will be the most polarizing aspect of the earphones, the treble is thinner than neutral and nicely extended but the quantity will not be enough for those coming from more vanilla armature earphones. I have the luxury of owning both the ie800’s and Primacy’s and I find them to compliment each other really well with a similar low end and midrange response but opposing treble tuning. Whilst the ie800 is more immediately engaging and even impressive, the Oriveti has the smoother, more listenable response of the two. The same goes for Westone’s W30 and W40, both of which boasting similar extension but a more linear tuning with additional sparkle and texture. The Primacy’s treble is smooth but slightly uneven, there’s a dip somewhere in the middle of the high end that saps presence from certain high notes. Otherwise, I didn’t notive any raspiness or graininess to the treble and the majority of the time, instruments were well reproduced. The soundstage is really nice for a sealed earphone with very impressive width and great depth. They still lack the outright space and pinpoint imaging of the vented ie800’s and perhaps lose a little depth to the UM 50 Pro’s but compared to other $300 earphones I’ve tested, the Primacy’s are among the best. Imaging is probably the weakest part of the soundstage due to the more oval presentation, the Westone’s and Sennheisers are more well rounded in that regard, but separation is fantastic, just behind these much more expensive models. Westone’s W30 and W40 both lose out in terms of space but have a slight advantage in terms of imaging accuracy and I do slightly prefer the more rounded presentation of the Shure SE535 LTD. The Primacy’s have a very low impedance of 11ohms but still aren’t the most sensitive earphone out there, being slightly less sensitive than the Westone UM 50 Pro and similar to the ie800’s. I also didn’t notice too much impedance swing with my HTC M8 when compared to my Oppo HA-2 which will suit portable listeners running the Primacy’s through their phones. Due to the low impedance, amping isn’t required, the earphones don’t benefit a lot from an amp besides reduces background hiss, to which they are decently but not outrageously sensitive, and will scale nicely with a solid DAC. I couldn’t hear any noise from my HTC 10 but could discern a slight hiss from my Oppo HA-2 on high gain. If you`re new to audio, a little bit of research and a mindset open to new, perhaps slightly more budget orientated brands, could save you a whole lot of time and money. If it isn’t apparent already, the Primacy is a very impressive earphone, not only in the ever important sound department but also pretty much everywhere else. The un-boxing experience oozes character with that same meticulous detail extending to the perfectly machined alumium housings and custom tuned drivers. The Primacy provides some of the best comfort I’ve experienced from an over ear iem whilst retaining isolation, something that’s a lot harder to find than one might think. Oriveti have done a fine job tuning the sound as well, you can see that I’ve made comparisons to some much more expensive earphones and whilst they still out perform the Primacy, the law of diminishing returns has never been so pertinent. But comparisons to similarly priced models such as the Westone W30 and Shure SE535 (both are actually more expensive) reveals that the Primacy is undoubtedly the better performer, with a more versatile sound that has greater extension on either side of the spectrum with some extra finesse in between. When compared to similar “flagship killers” such as the Dunu DN2000, from my brief time with the Dunu’s I would say that the Primacy is on par, not wose, not better, just different, but is ergonomically far superior. Accessories – 9.5/10, Nice un-boxing experience with a huge selection of accessories. Great for travel, plenty of tips for almost every buyer. Wish they would come with Spinfits since they have great synergy. Fantastic aluminium case is not portable but very protective. Design – 10/10, Super solid housings that are both extremely comfortable and stable. Still a little more prone to losing seal than traditional monitors due to less ear contact but also have more long term comfort as a result. Great isolation for travelers both with silicone and foams. Cable is nice but still less supple than the Westone EPIC cable, also has some shielding issues. Wish it had a right angle 3.5mm plug but at least the straight plug is compact. Logos laser etched for longevity. Bass – 8.25/10, Very extended, elevated sub-bass but otherwise quite neutral. Very clean response without flab or bloat, no midrange spill. Great texture and PRAT, faster decay times retain punchiness without sacrificing slam. Mids – 8.75/10, Very clear mids with spot on vocal presence and a slightly brighter than neutral tonal tilt. Great clarity, nice sense of body and a lot of detail up top. Treble – 8.5/10, Crisp and clear with just a slight dip in the middle. Sits slightly behind the upper midrange but never gets overshadowed. Retains enough clarity for an engaging listen but doesn’t put emphasis on treble notes. Slightly thin body. Higher details can get messy. Soundstage, Imaging and Seperation – 7.5/10, Great sense of space with an emphasis on width. Imaging is very good but not quite as accurate as pure armature earphones. Separation is also impressive, with much more delineation between notes than the Westone W30. Overall – 9.25/10, Ultimately, Oriveti have nailed hybrid technology and provided it within an approachable form factor and price point. The combination of ergonomic and sonic excellence create a truly compelling listening experience whether plugged into a smartphone or dedicated source, just don’t expect tons of mid-bass punch or treble shimmer.